Here’s the third instalment of the Four Square Stores promotional snap set that was an issue sometime between 1979 and 1981 (there were two other sets I know of that I have now pinpointed to being produced in the early 1960s). I am still working my way through restoring this set digitally (they are quite damaged) and will post them in separate families of four until I get through them all. The set is missing one card from the Savlon family, “Miss Savlon”, but I’ll deal with that when I get there. 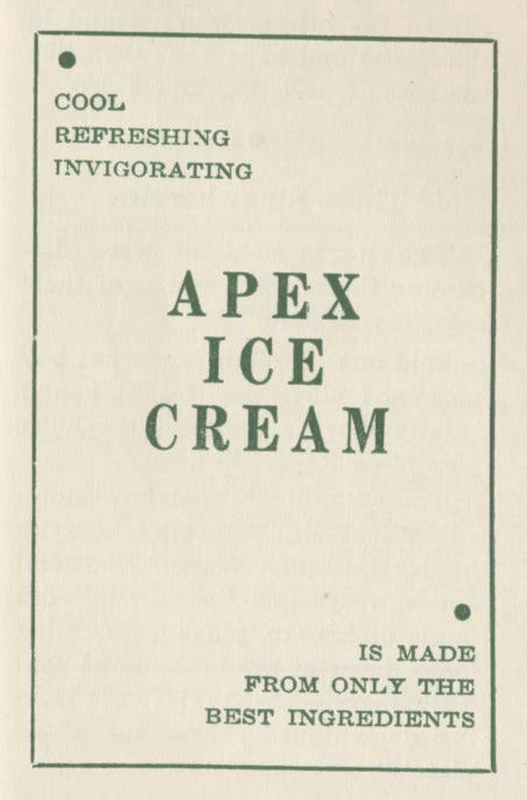 This ETA logo was registered in 1935 by Griffin’s to market “condiments, including mustard; nuts, including peanuts and almonds; confections containing nuts; and other nut products, including nut paste and nut butter”. 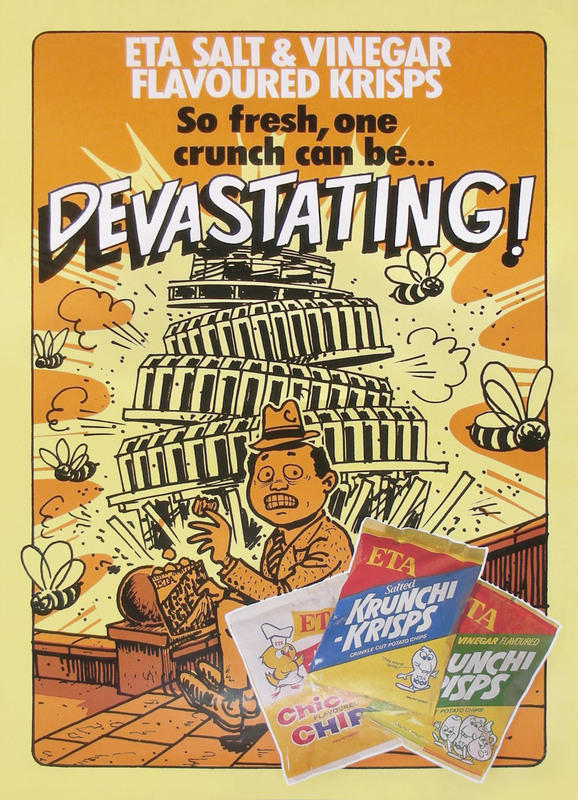 It seems that at some point in the 1960s – likely 1962 – ETA opened proper operations in NZ; or Griffin’s, which the brand was licensed to , opened a manufacturing facility (this seems to coincide with the Australian ETA factory in Sunshine , Melbourne being demolished in 1962 and new factories also opening that year in Baybrook , VIC and Marrickville, NSW – ergo signalling a large Australasian restructuring of the company). 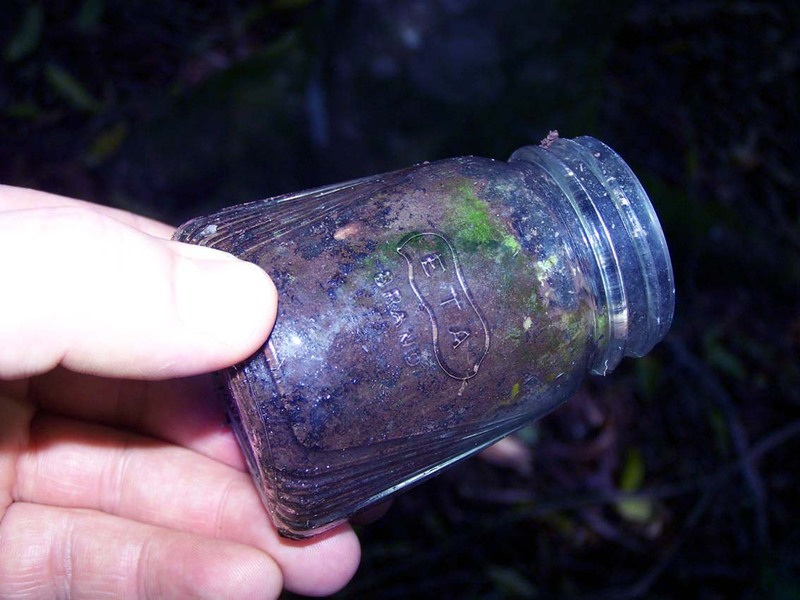 This ETA peanut butter jar was found recently on a historic farm site in the South Coast NSW I was surveying, and probably dates from the late 1930s, definitely no later than 1950. 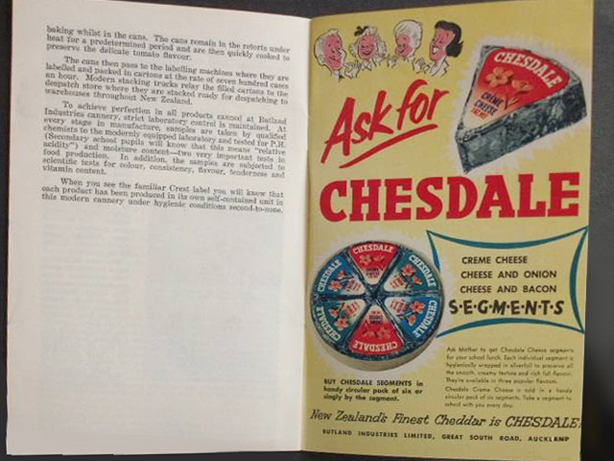 I’ve positively identified packing boxes for ETA chips in an early Woolworths NZ store in 1964. 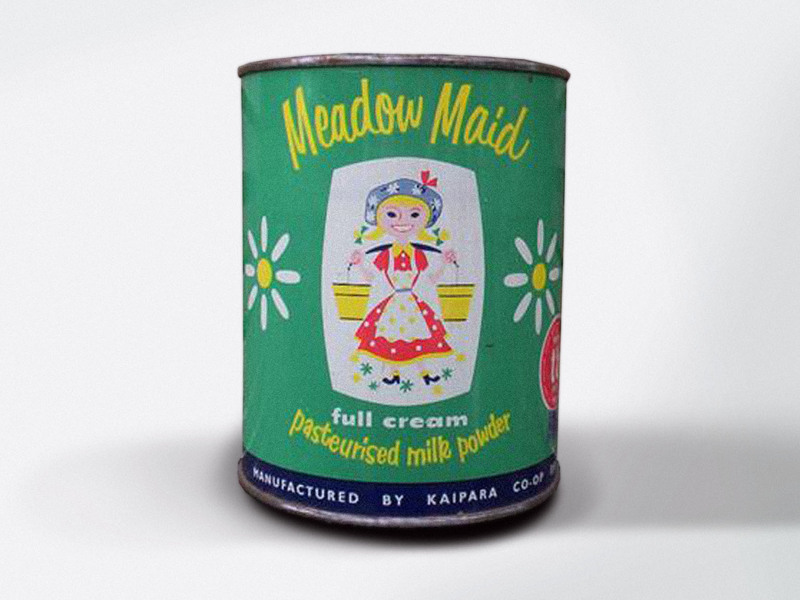 ETA actually began in 1923 – a small family company in Australia producing mustard, fruit syrup, compotes and jams. 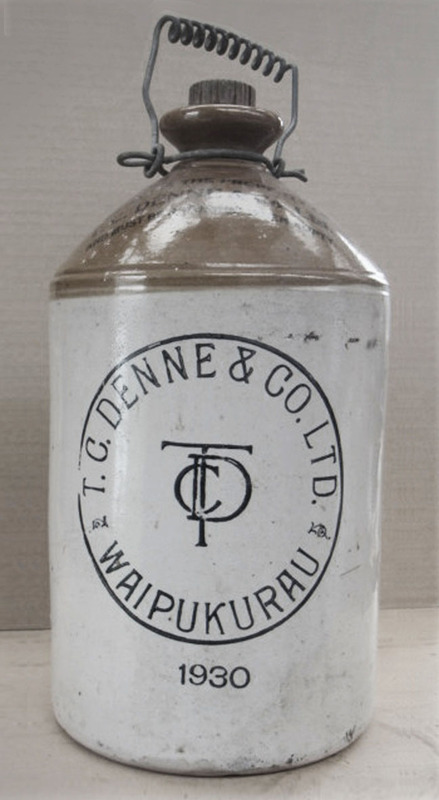 I already knew the brand was established much earlier in Australia as I have found ETA jars going back to the 1930s on historic sites so it’s likely products were exported to New Zealand up until the time the domestic factory launched. 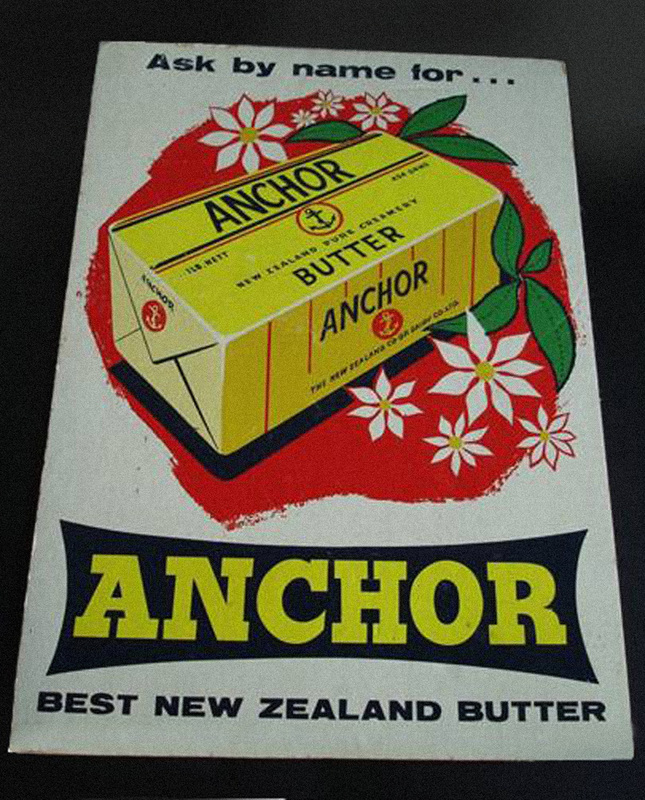 However the ETA brand had been registered in New Zealand by Griffin’s (primarily famous for their biscuits) from 1935 onwards to market. 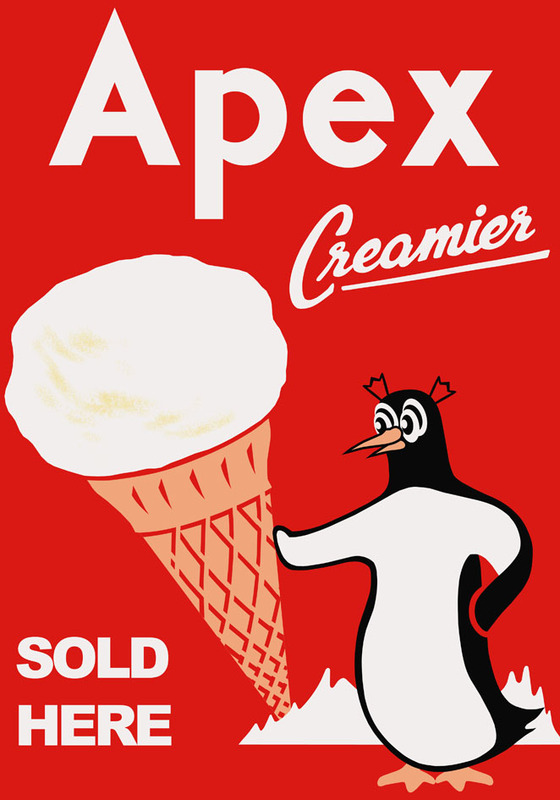 This point-of-sale cardboard poster would have been from a dairy late 1970s-early 1980s and is courtesy of Mike Davidson (Kiwigame on Flickr) and edited by me to bring it back closer to original form. 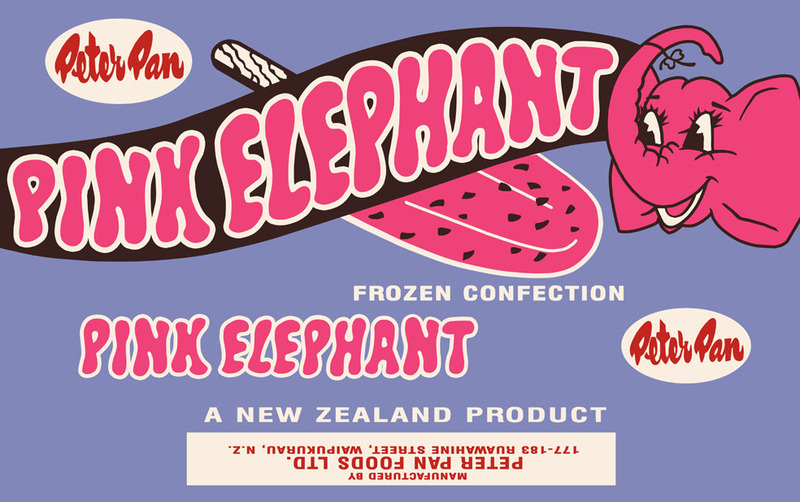 ETA was another one of those brands like Sanitarium, Frosty Boy, Woolworths, and many more – which although started off or remained as the same company – more or less separated their trans-Tasman concerns early on and from there developed fairly independently. 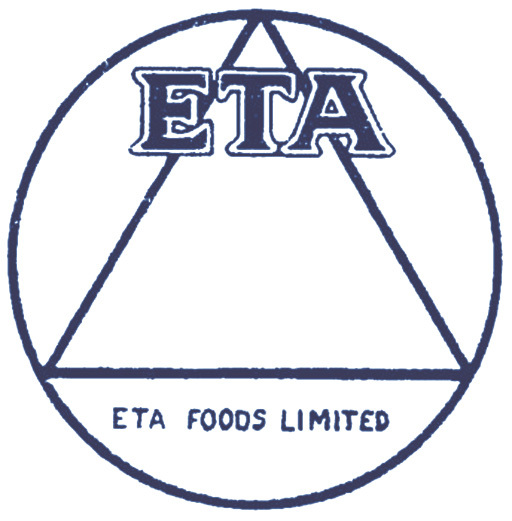 ETA seems to have remained under Griffin’s wing until recently when Brittania Foods NZ Ltd, an Indian-based company which entered into a dairy concern partnership with Fonterra starting in 2001, acquired the brand. However according to the official site the product is still being manufactured by Griffin’s to date, probably under a licensing deal. 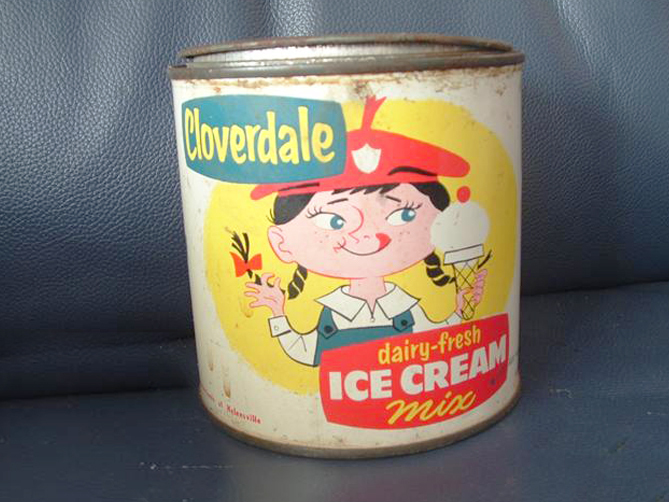 This “Cloverdale” brand Ice Cream Mix tin was up for auction a little while back. 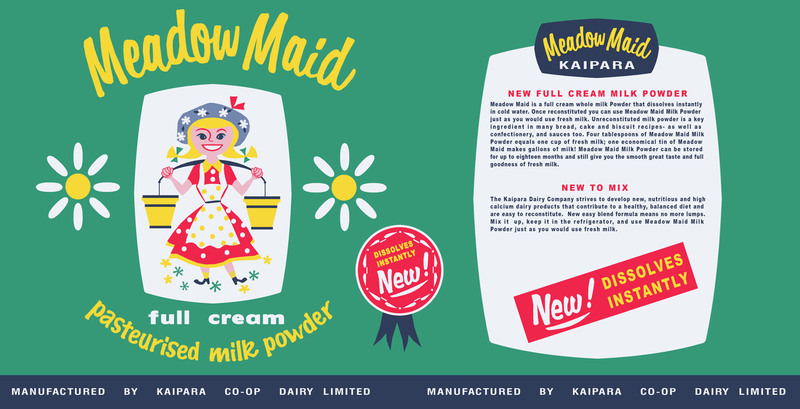 I have never seen one before or since, but in the meantime a couple of other items have turned up from the Kaipara Dairy Co-op; a Gouda box and skim milk tins – all with wonderful graphics. 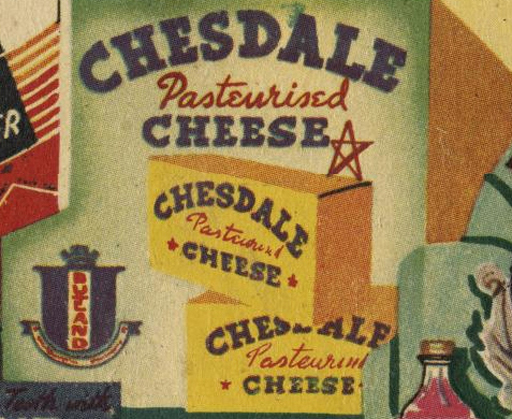 I am assuming the products tasted delicious (mmm, can’t go far wrong with cheese or butter), but they also had a fabulous designer! 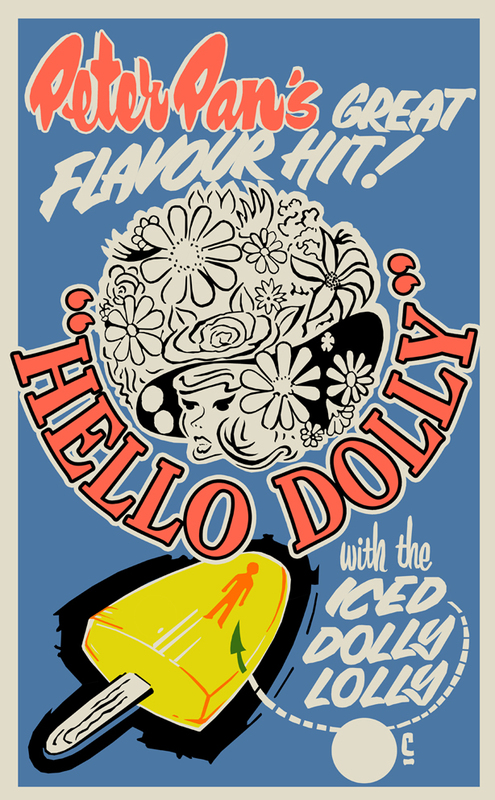 A little out of my price range, combined with shifty dealings from Trademe sellers and plenty of missing mail has kind of made me reticent in my purchasing so I settled for recreating the design myself. 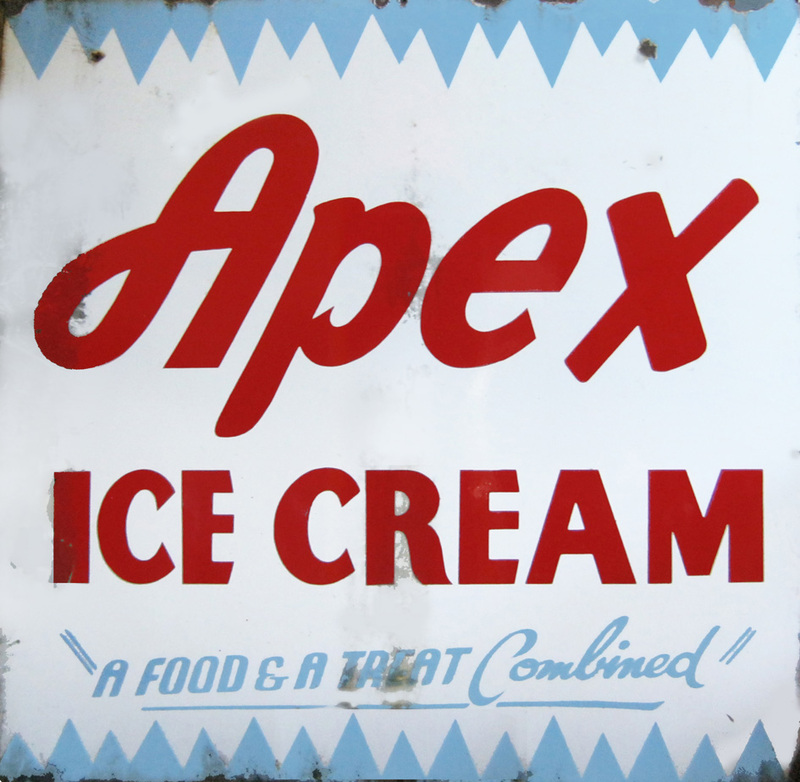 Apparently once with a great 1950’s curved glass exterior the premises has now been completely smashed inside and out by vandals. 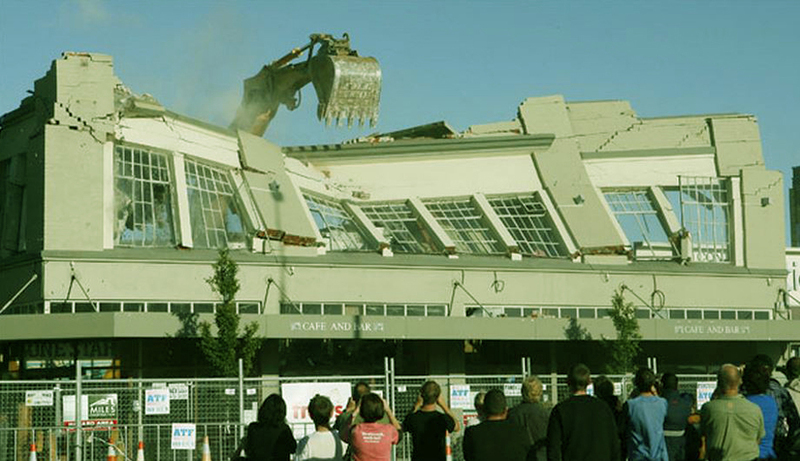 The building is still standing to my knowledge, as testified by the many online photos of the grafittied ruins – but perhaps only just; I believe it was on the auction block recently, failed to sell and the owners ordered by local council to demolish the buildings due to “danger” by end March 2011. 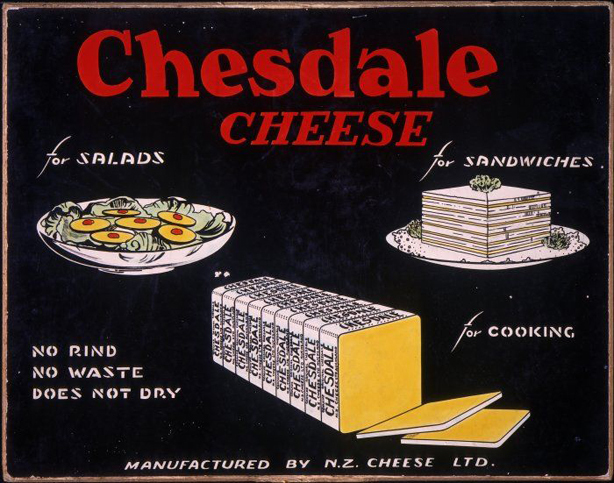 It was very a successful company during its heyday and one of the more innovative dairy enterprises of it’s time – during the seventies the company ventured into the manufacture of Margarine – the first New Zealand company to do so – building an edible oils factory which is adjacent to the building and producing the “River Valley” brand. 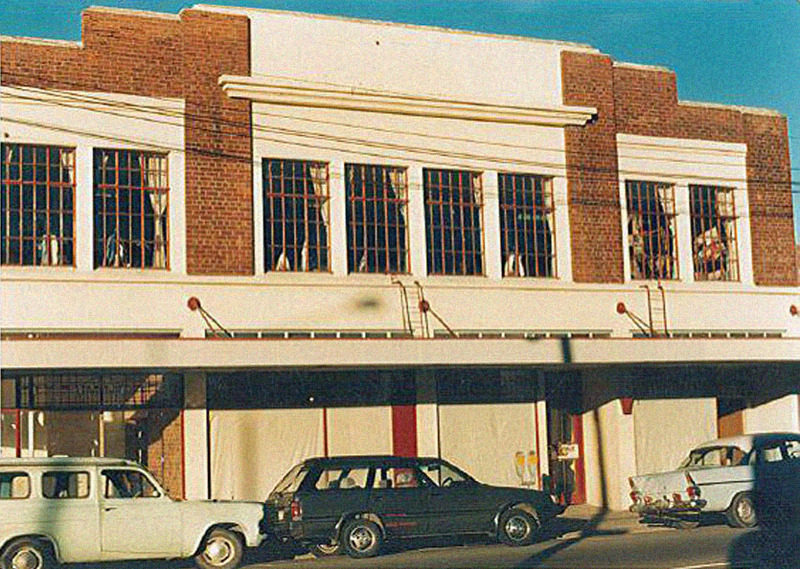 The factory shut in the late 1980s with the general decline in farming, as well as general economic downturn resulting from “Black Monday”. 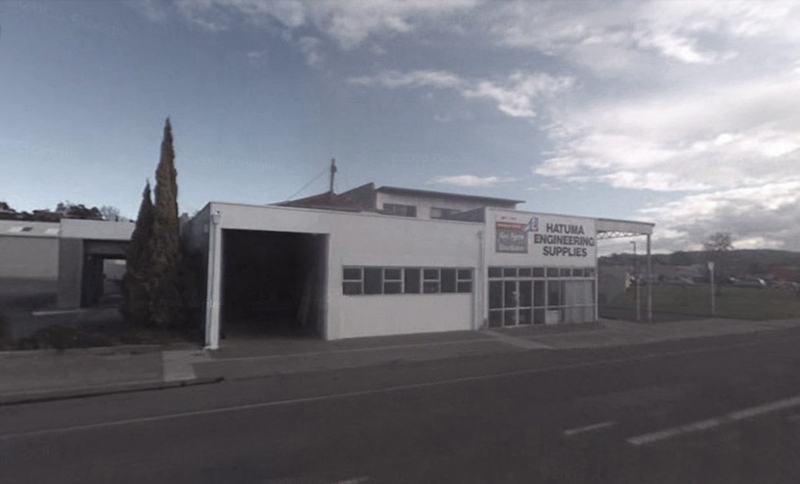 In 1987, The buildings were sold to Martec Industries who attempted to run a fruit juicing operation there and failed twice. 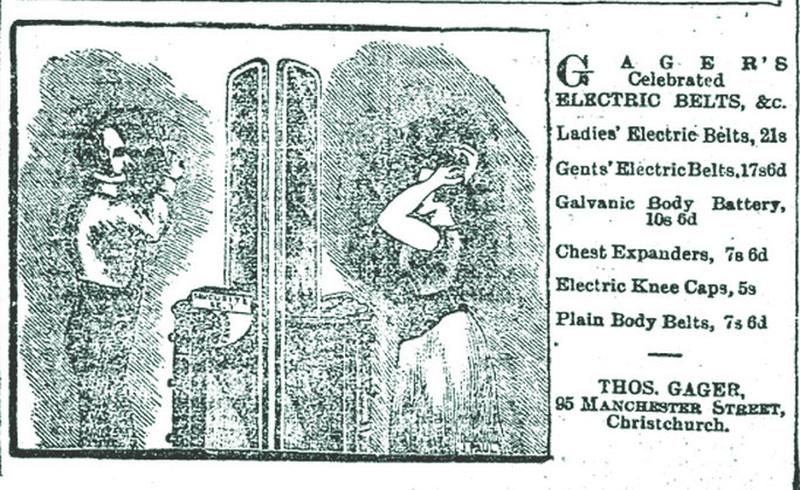 Finally the company was put into liquidation around 1989 and the machinery within the buildings stripped out and sold. 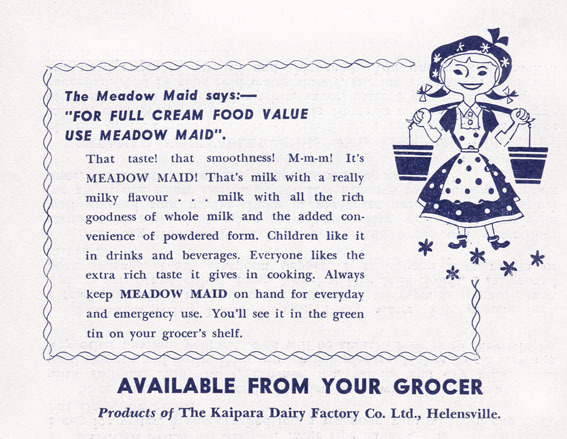 The River Valley brand went to Meadow Lea Foods Ltd.
AnchorMart Ltd was formed from the retail divisions of NZCDC and the Kaipara Dairy Cooperative. 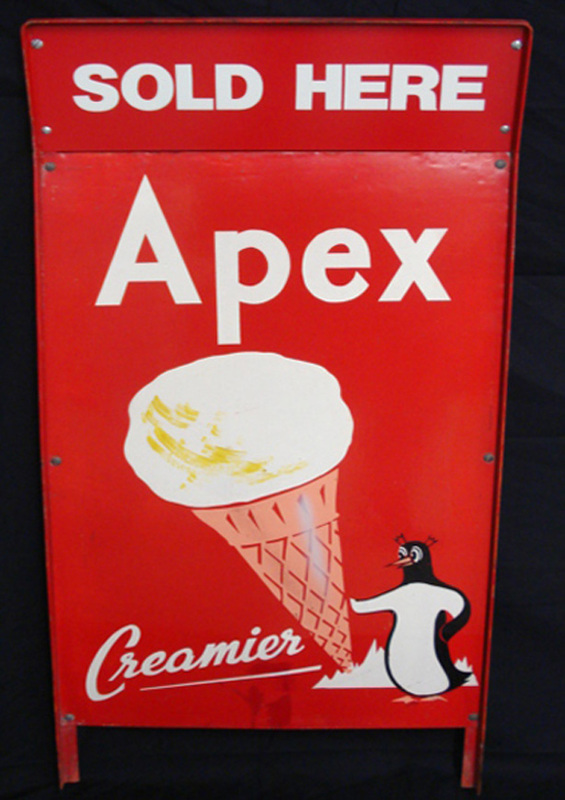 Over the next decade a series of many mergers and acquisitions took place, until the company eventually became what is known now as, you guessed it – Fonterra, or – what I have come to think of as “the big creamy dragon, eater of all brands and abandoner of neat logos”. 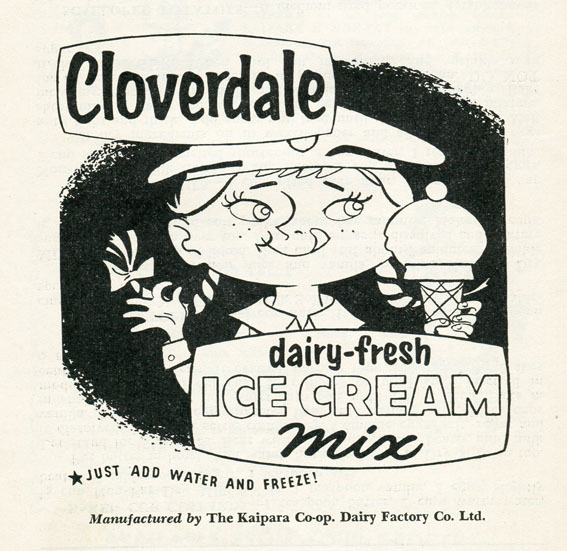 Addendum, early Aug 2013: Finally this week not one, but two ads turned up at the same time showing that Cloverdale was in production from the mid-late 1950s. . 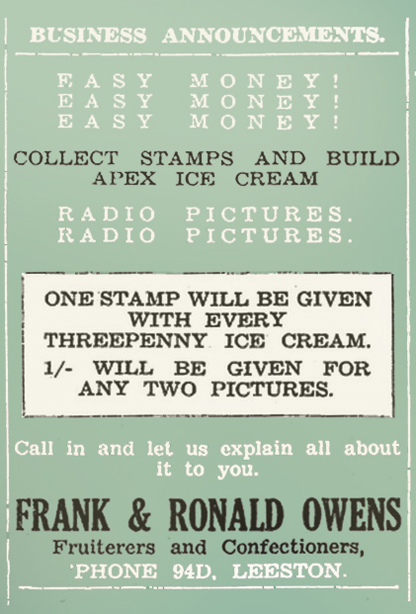 The Weekly News, Feb 29 1956. 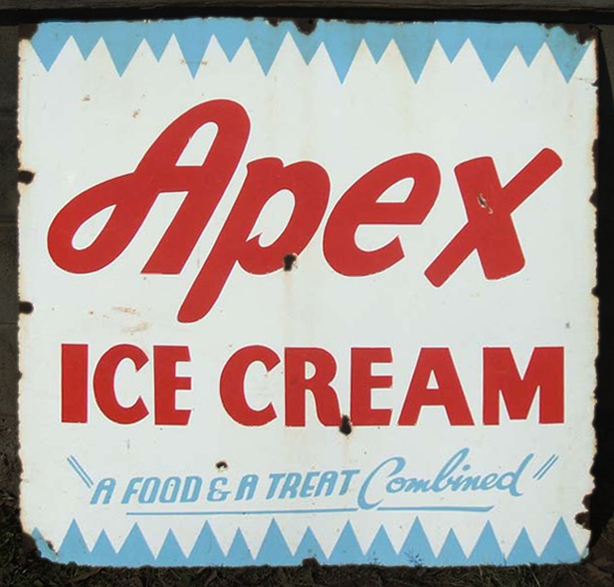 From an original photo of a tin sign courtesy of Cheryl Kelly. 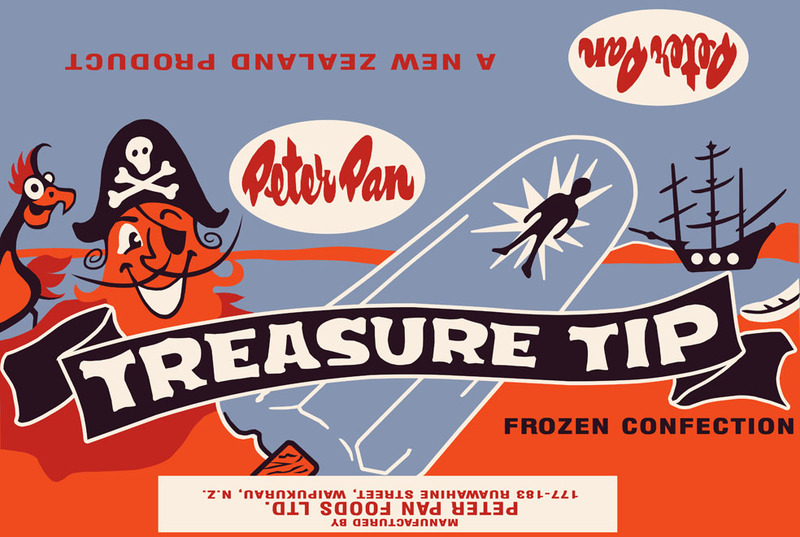 This is one of my more recent purchases from Trademe – unused Peter Pan “Captain Hook” iceblock wrappers. 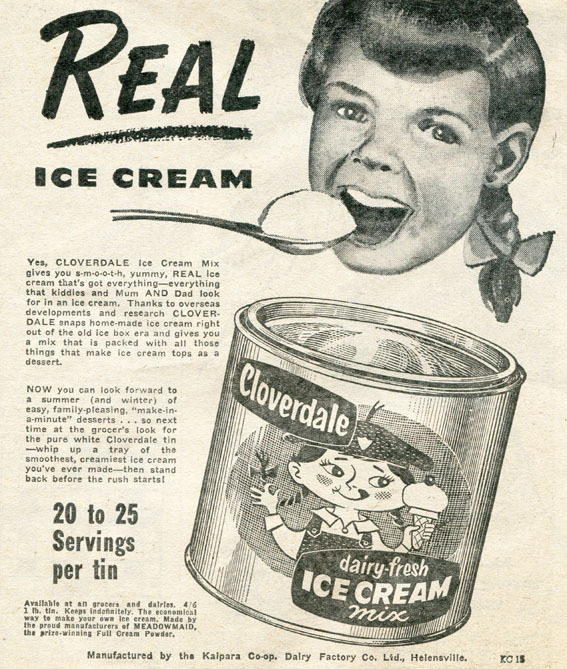 (nothing to do with the ConAgra products “Peter Pan” brand which was involved in that nasty Salmonella scandal a while back). 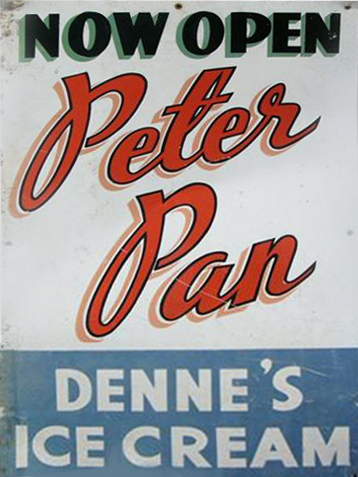 The Peter Pan brand was started by the Denne brothers, Haden and Tom. 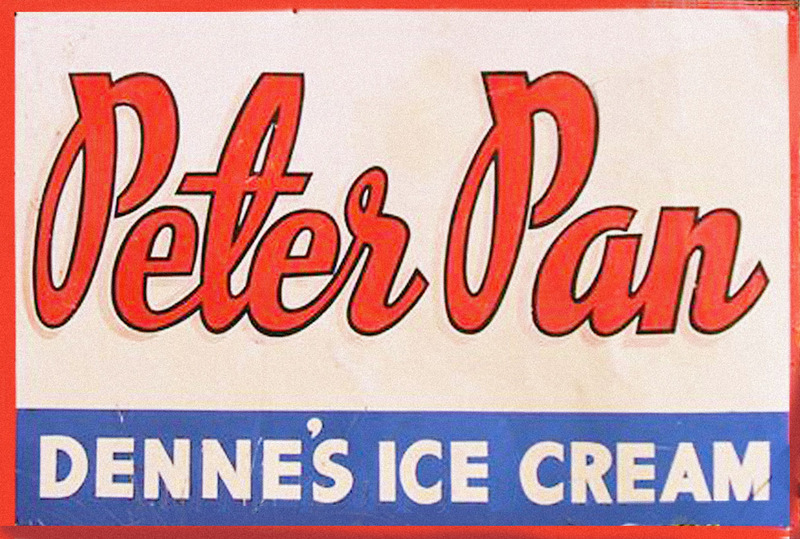 Peter Pan products were once broad and included Icecream (cones, slices, pints and quarts); Novelty ice confections (such as the lurid post 1969 “Hello Dolly” with a doll shaped candy impregnated in the middle); Puff pastry and pastry products; Spring Rolls, Cobs, and croquettes masquerading as a range of “exotic Chinese foods”, and syrups for milk and thick shakes and sodas. 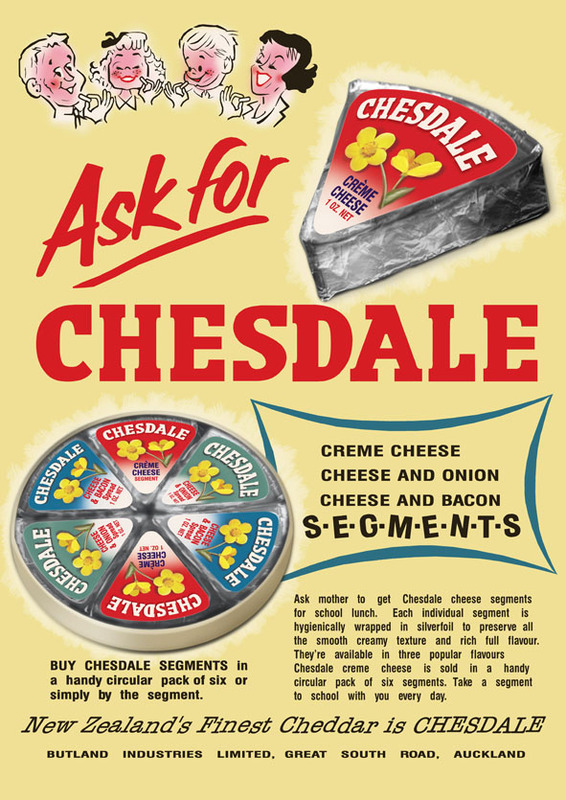 Both this and the cherry label below are from my personal collection.I’m guessing earl-mid 1970s, for these ones. 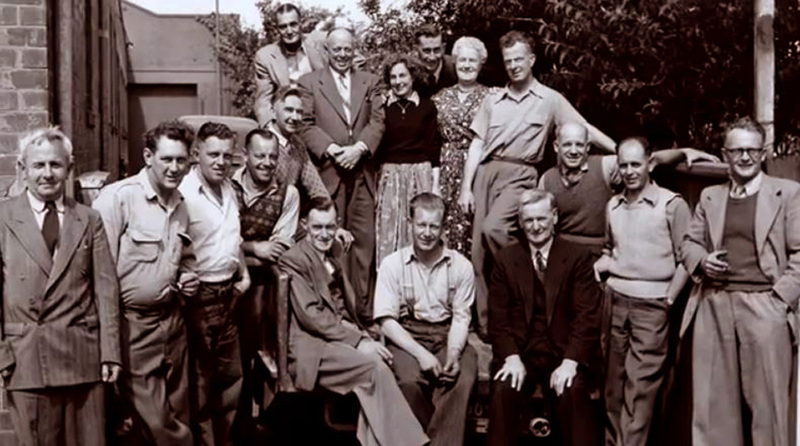 There are records dating back to the late 1940’s, and the company prospered well into the late 1970’s when it seems to have hit some problems and many staff were handed redundancy packages. 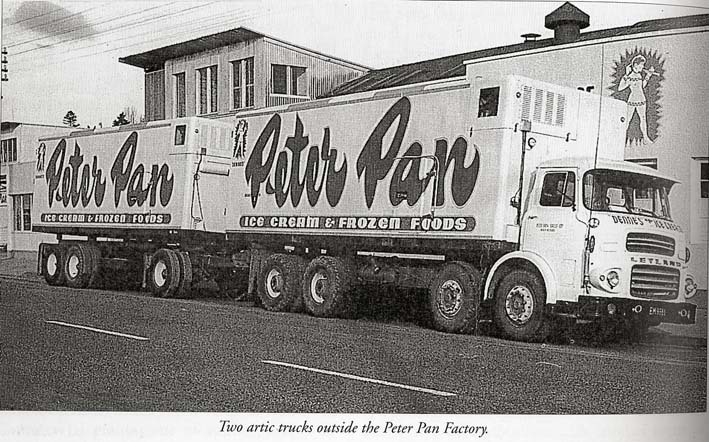 With a slightly revamped name, “Peter Pan Frozen Foods Ltd.” it seems to have continued on in some form until the late 1980’s. 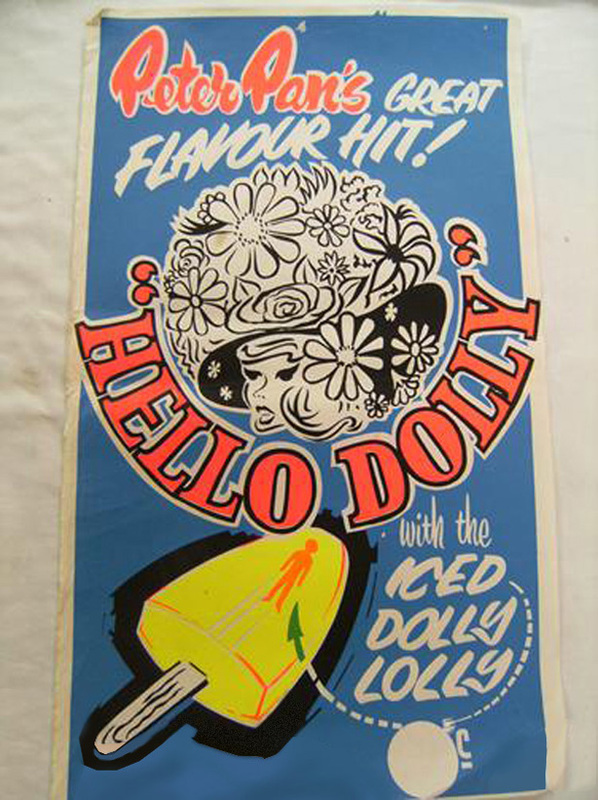 I would take an educated guess these were salvaged from the factory some time in the late 1970s-early 1980s. 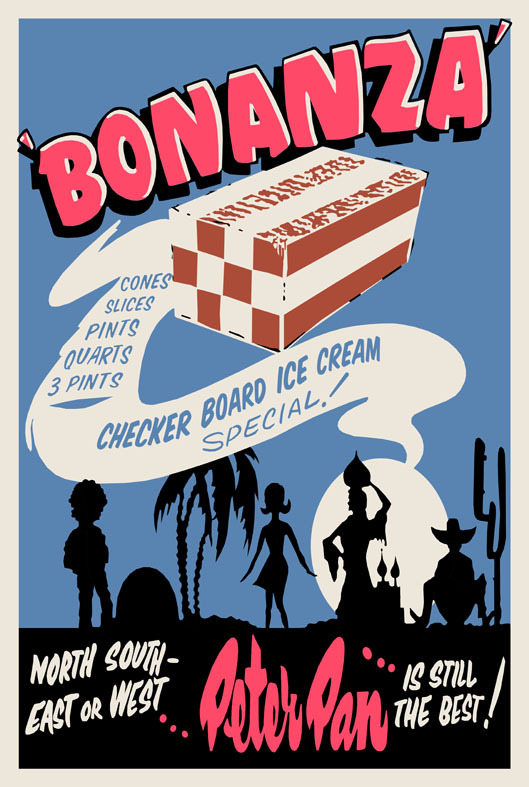 Cherry was a fairly unusual flavour then, it was considered more of an “American” thing along with others like blueberry and watermelon. 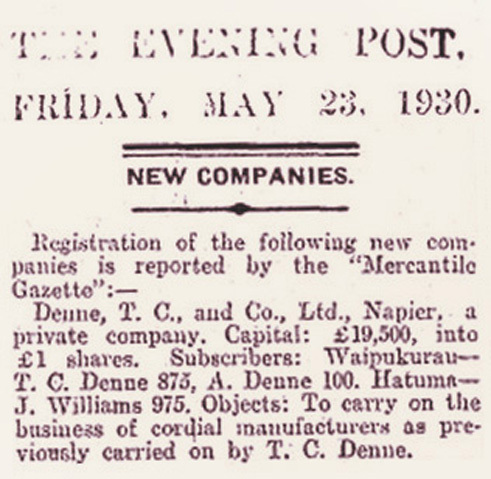 To be honest I don’t remember Peter Pan products being around myself (it was probably more or less a geographical thingso didn’t make it to the upper reaches of the North Island), but obviously the company was well established and popular in it’s time with Barry Pulford remembering “…at 909 Heretaunga Street East, about 1966, there was a dairy next door to the Family Foodmarket Ltd where I worked after leaving Karamu High School. 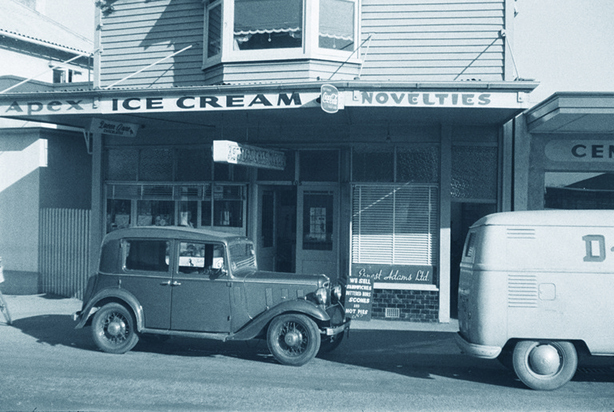 And next door to the dairy was the Blue Moon ice cream factory which later moved to Havelock North. 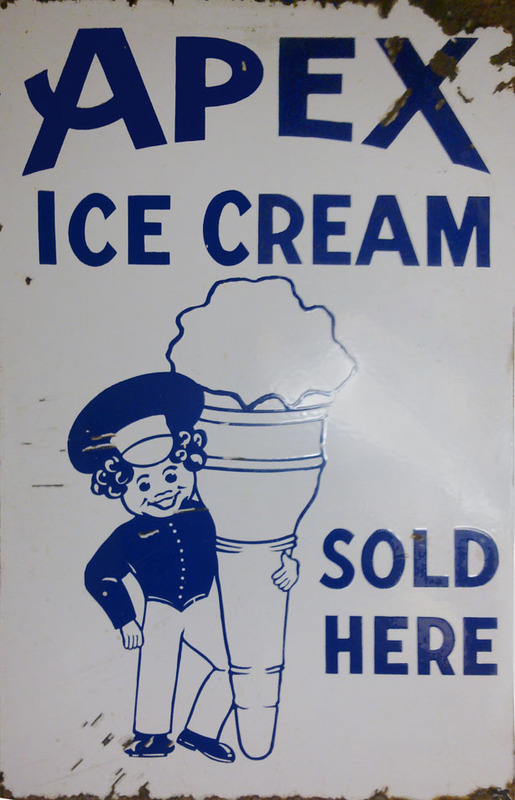 Sadly the Blue Moon and Peter Pan brands of ice cream are no longer available but they were delicious“. 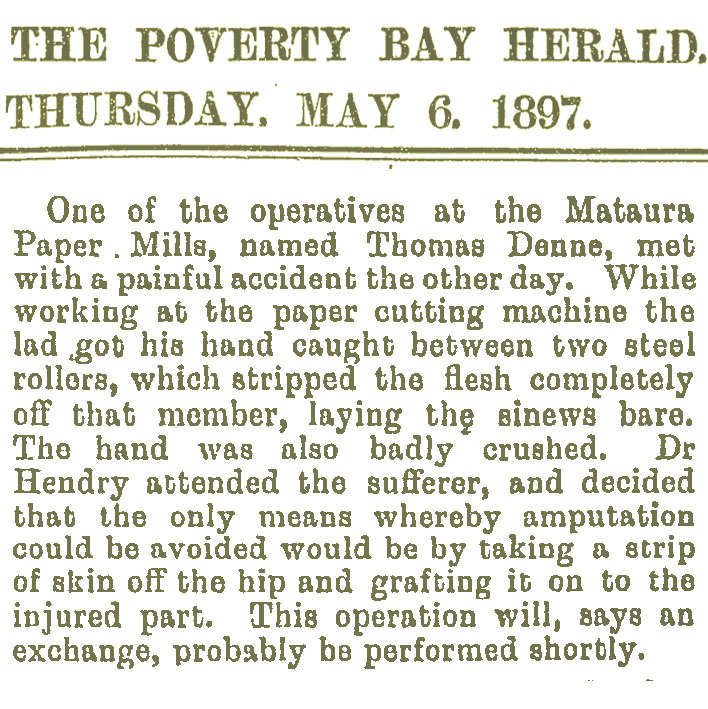 From this we can assume that the Peter Pan factory was also in Hastings not that far away, indicated by Barry adding it into the description of the local area. 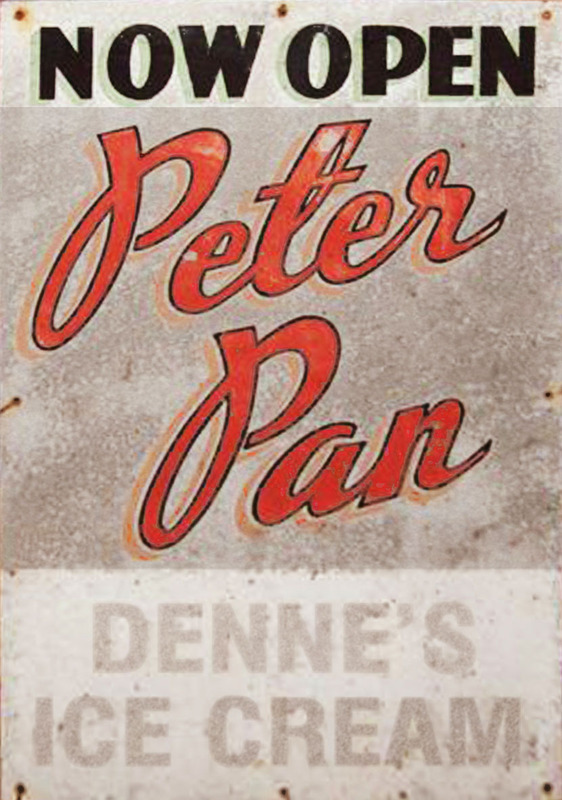 I still can’t track down the location (or figure out the purpose) of this Peter Pan parlour. 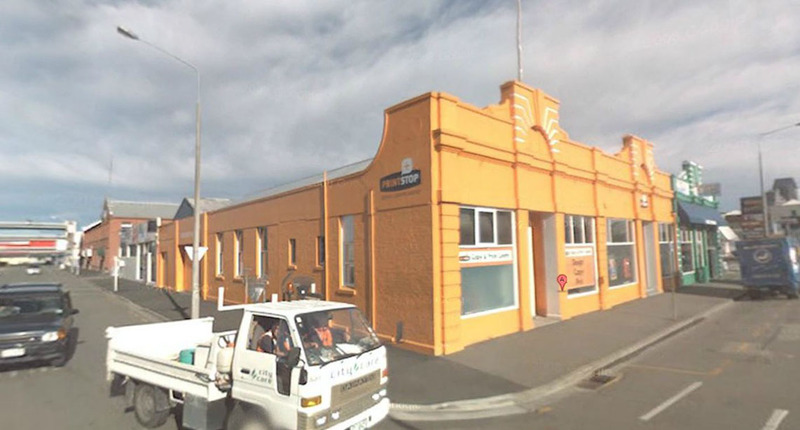 Here is a photo of a building commemorating the factory and brand, although, probably a parlour and outlet in Hastings, as mentioned above. 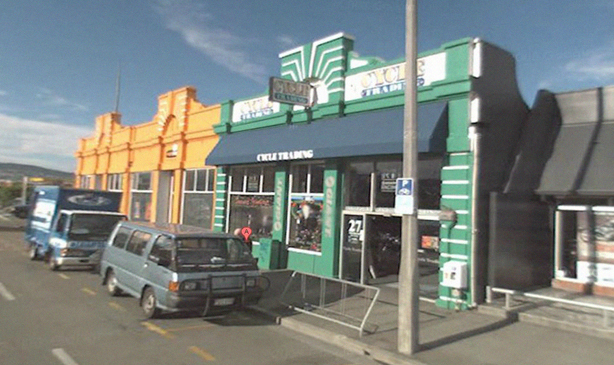 Now a Trompe L’oeil vignette rather than an open business, this apparently is not the original location, which was in Waipukurau and was still running, as we can see from this photo, in 1970 at that location. The No. 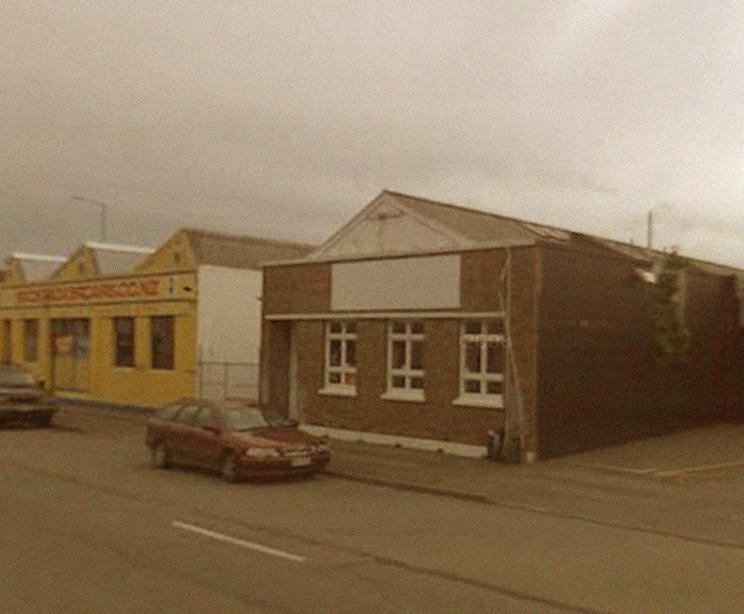 1 factory outside of Waipkurau on Takapu Road (it was then called Ruataniwha Street) and Cook Streets.This photo taken in 1970, and courtesy of Kete Central Hawkes Bay / the Central Hawkes Bay District Libraries Millenium Project and the CHB District Settlers Museum. 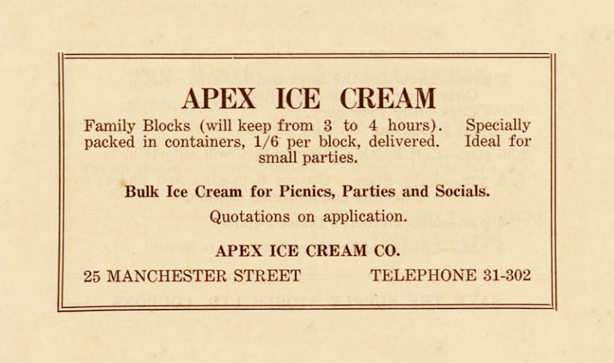 Unfortunately, apart from entries at the NZ Intellectual Property Office for the brand (Country Gold, Fudgsicle, Peter-Cream and Softee ) there is not much available information. 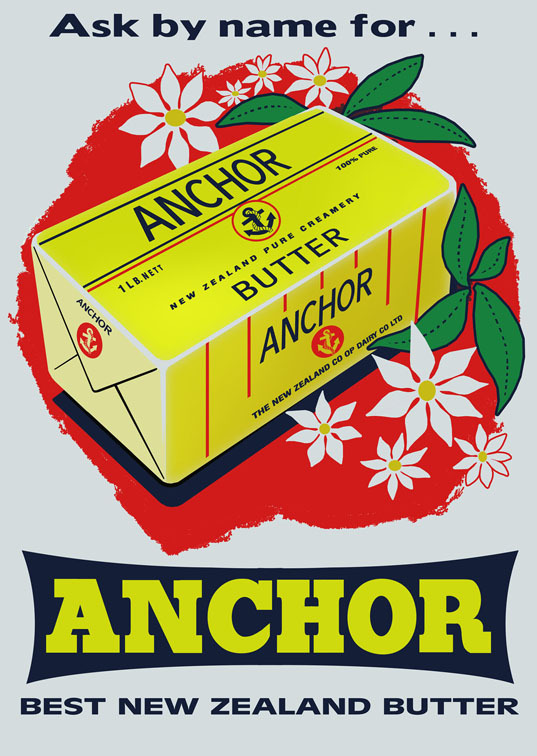 However again like the “Buttermaid” brand (I posted on this in March), Fonterra aquired it as part of their purchase of Tip Top Investments Limited, where it has become “abandoned”, probably forever. 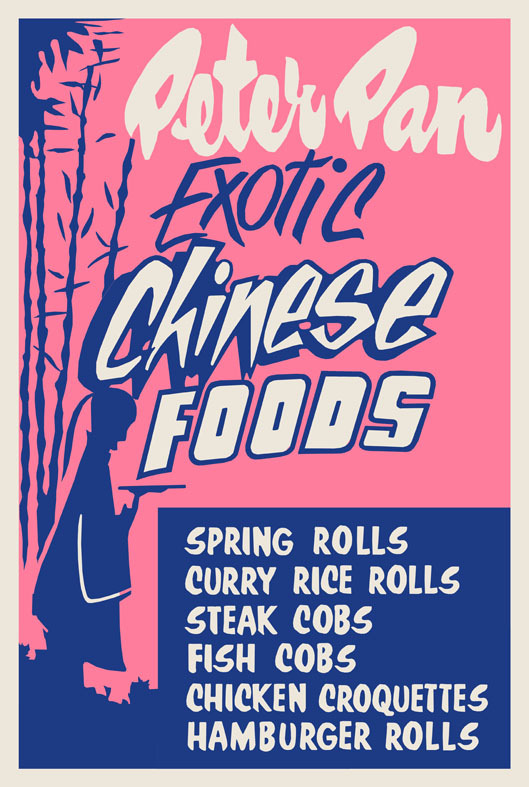 So not much remains, except for a series of wonderfully kitsch and gimmicky 1960s posters someone sold off recently, which I’ll clean up and post later in the year when I revisit the Denne Brothers. 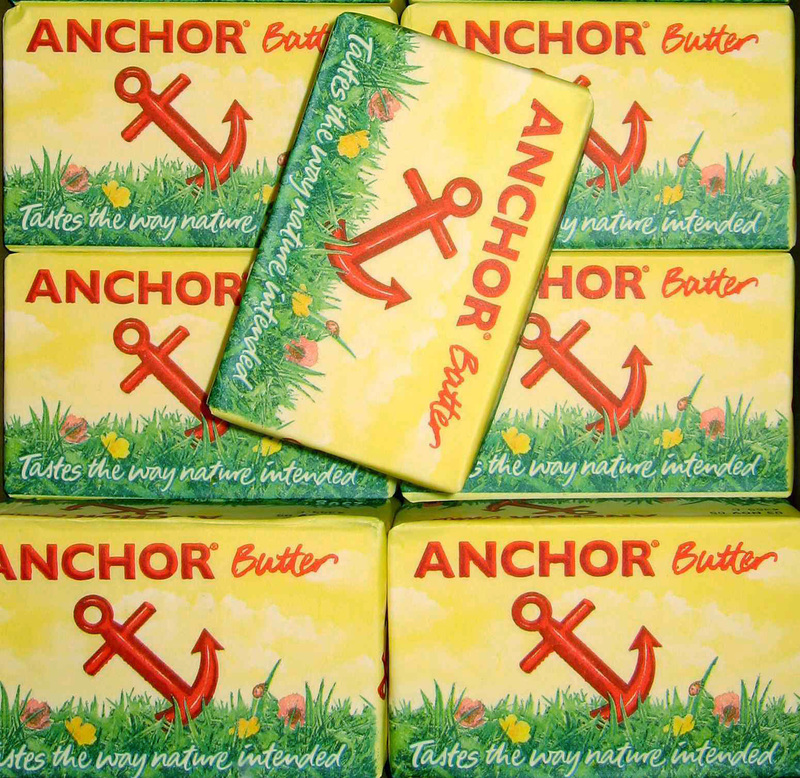 Often I just can’t understand why, when something has been enjoyed by so many people for so many decades, it so quickly slips into obscurity. 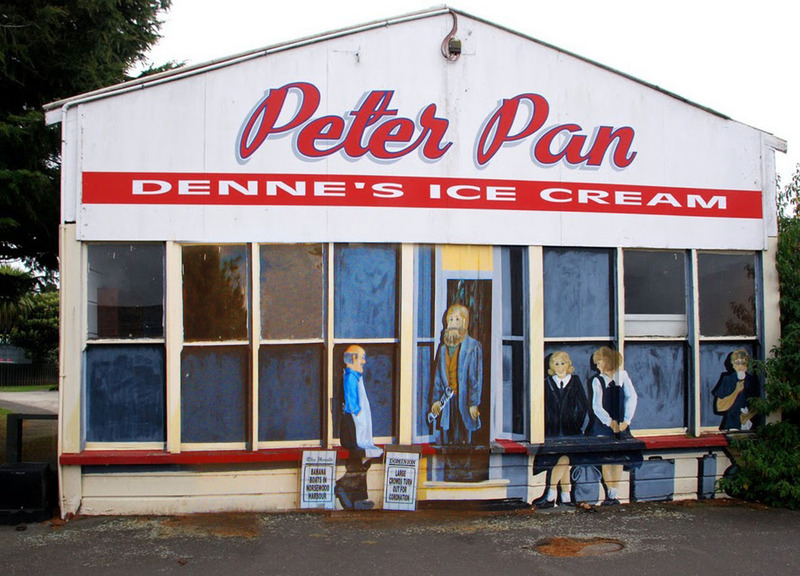 Addendum: After writing twenty or more letters to individuals, in January of 2011 I finally tracked the Peter Pan “memorial” parlour to a small town of 300 or so people named “Norsewood” south of Waipukurau. 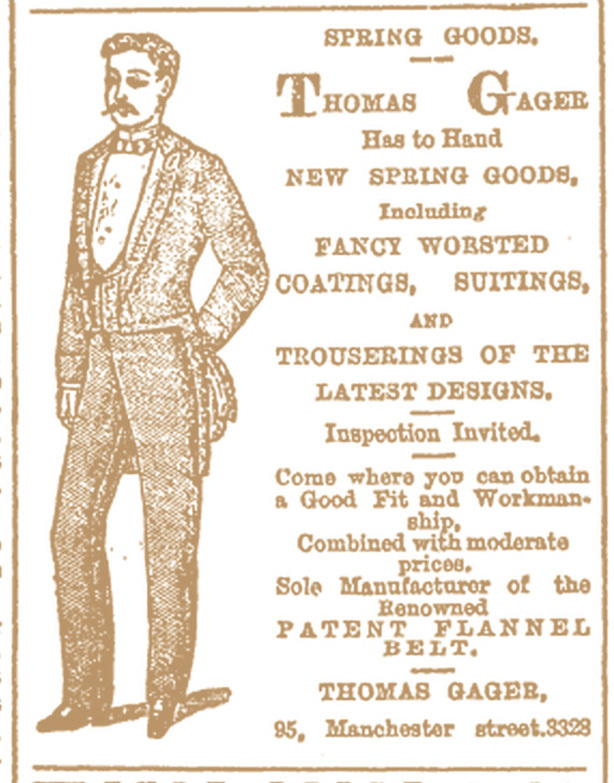 Although not that far away in the scheme of things from the town where the factory was, it remains a mystery of firstly – who made it? And more to the point,why? 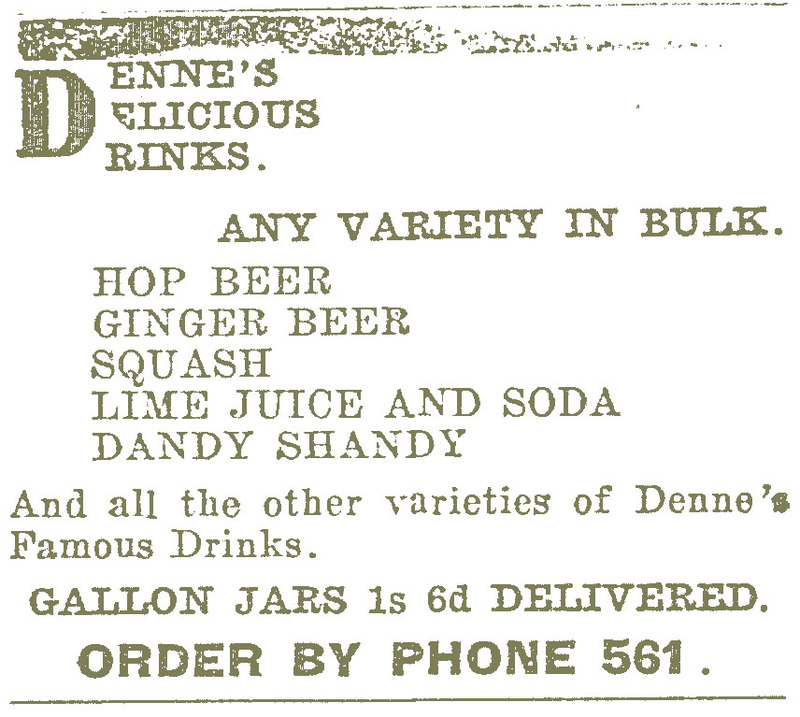 Given that so far my research shows that the Dennes never had anything to do with Norsewood, I can only speculate that perhaps it was created by an ex-factory employee in memory of a much-enjoyed job? I am sure I’ll be able to get to the bottom of this conundrum.